Your living room never looks so bare as the day you take down your Christmas tree and pack away the wreaths, candles, ornaments and holiday fixings. It's the time of year you feel like refreshing your living spaces, and even in rental properties you can switch things up thanks to the availability of fabulous and reasonably priced interior pieces from IKEA. There's no need to have to paint the walls or go through the hassle of wallpapering, you can create a fresh new feel to a room with the right soft furnishings and furniture. Personally, I've set my sights on our small bathrooom to be the target of my January makeover spirit. We have a shower cubicle, sink, toilet & one wall mounted cupboard. My plan is to give the room a new look with a new bath mat & towels, but also to introduce some house plants & ferns in the space beside the shower which is currently just an empty space. I also want to buy hanging pots to layer down the outside of the shower cubicle. In my mind I'm picturing a tropical rainforest, so let's see how that one turns out! As well as the bathroom, I'm hoping to pick up some other bits & bobs on our trip to IKEA Belfast this weekend. They shared with me a sneak peek at products that will be appearing in stores in spring and the summer ahead. 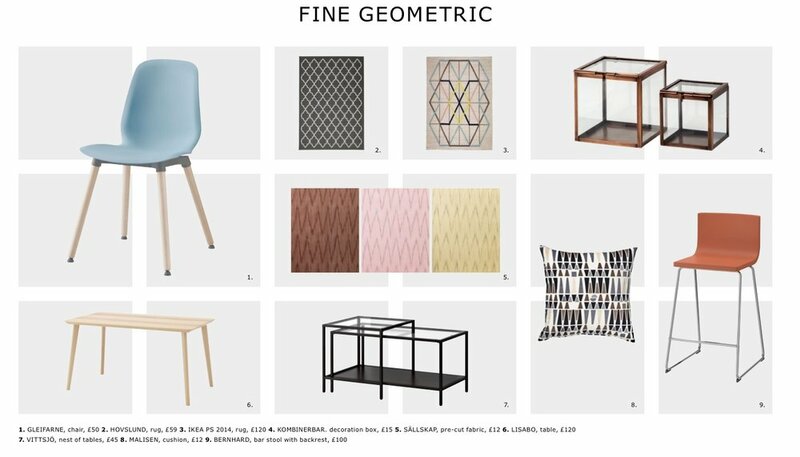 There are a number of special collections, but the one that jumped out at me was 'Fine Geometric'. There's a mid-century feel to the products with definite Eames' style inspirations. 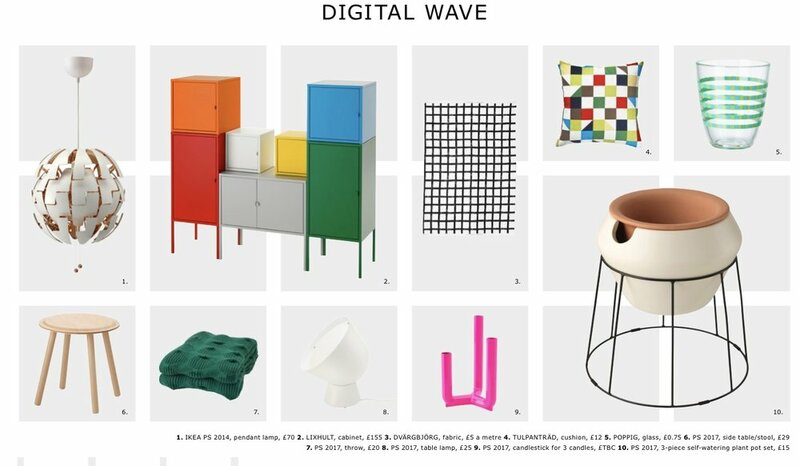 Digital Wave also has retro futuristic touches, and how could I resist that rainbow cabinet? I also love the deep, bottle green throw (7), and vivid, Barbie pink candlestick (9). 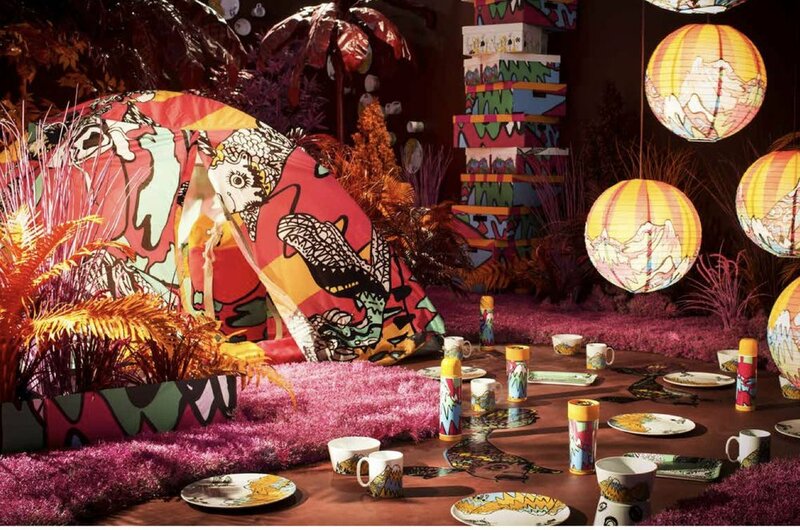 Again IKEA has partnered with a fashion designer, this time Kit Neale, to produce the eclectic SPRIDD range. There's a Vivienne Westwood feel to parts of the collection, with orbs aplenty. It seems a lifetime away, but the SPRIDD collection has the items to make you the most fashionable festival goer this summer. Bright colourful picnic ware can be used by families as well as music festival campers, and you wouldn't be able to miss that tent amongst a sea of other campers. SPRIDD also reminds me of Moschino's pop art, bold patterned looks. 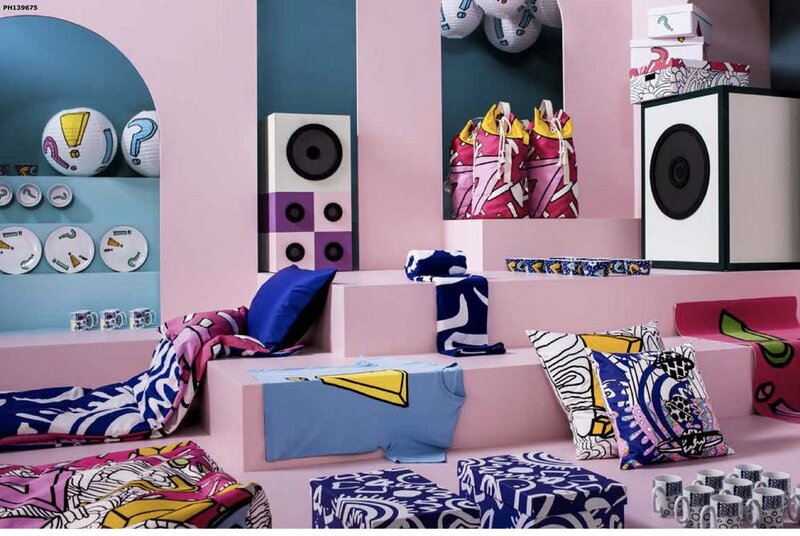 So there's lots to look forward to in IKEA Belfast and other stores this spring. In the meantime I'll be the one pushing a trolley packed with ferns this weekend!